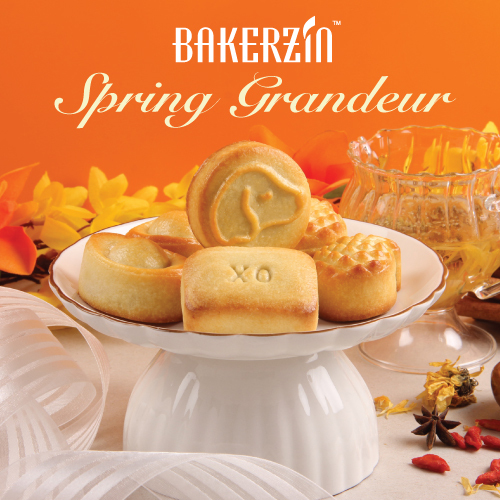 Celebrate Spring 2018 with Bakerzin’s Award Winning Pineapple Tarts! Tuesday | January 2, 2018	Revel yet again in 2018 with Bakerzin’s Spring Grandeur Collection of new flavoured Pineapple Tarts and cookies, as well as the most awarded and highly recommended, Original Ingot Pineapple Tarts. This year, usher in the year of the Dog with the premium XO Golden Pillow Pineapple Tarts, “wow!” you may say, until the first bite into this lovely and luxurious texture of XO Wolfberry and Pineapple Jam blend concoction, you will realize this is the perfect gifting choice for your bosses and dads! For a more subtle selection, we recommend the Bakerzin Assorted Pineapple Tarts collection, consisting of 2 new flavours, your quintessential Chinese New Year beverage and snack respectively, makeover into lovely Chrysanthemum Pineapple Tarts and Hae Bee Hiam (Spicy Dried Shrimp Sambal) Pineapple Tarts. The choice of Chrysanthemum is the surprise element, each floral tone marries the buttery tone of the tart perfectly, definitely enunciates the pineapple jam from within! The most unusual pairing of Hae Bee Hiam (Spicy Dried Shrimp Sambal) and the pineapple jam is a beautiful subject from the pastry chef, honing his skills to define pineapple tarts to the next level. We say, this is the must-try flavour amongst the new collection! Pair your tarts with Good Luck Cookies collection, with each crisp cookie baked in curated temperature! 8 (‘huat’) flavours in 8 packs, choose from Coconut Chia Seed, Thai Milk Tea, Long Jing Tea to Salted Egg Yolk Cereal or pick amongst the familiar favourites like, Black Sesame, Orange, Coffee and Chocolate. We bet you can’t stop popping once you have your very first touch! Ready for the season of gifting and ‘faux pas dieting’? Get 8% Members Discount on Spring Grandeur Chinese New Year Goodies. Download the above coupon now and claim in-store! For online purchases, apply code BKZCNY8 on cart to enjoy the discount! Usher Spring like never before, with Bakerzin!